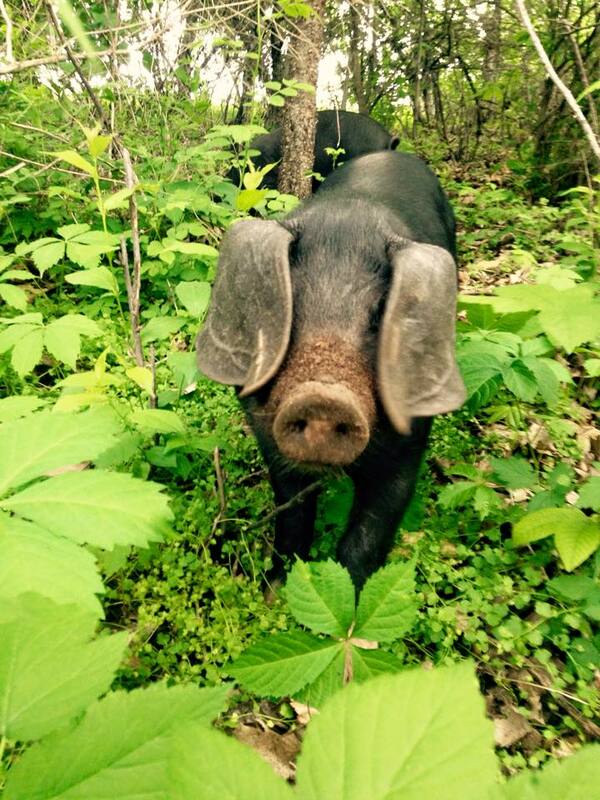 ​Dreamfarm is nestled on 25 acres of rolling hills between the Ice Age Trail and Swamplovers Foundation. 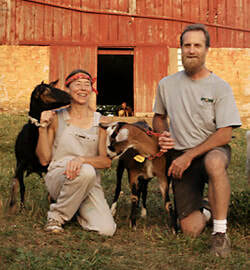 The farm was established as a farmstead, artisan cheese operation in August 2002. What is farmstead? This is a model of farming in which all cheeses produced on the farm are made exclusively from milk that comes from the cheesemaker's own livestock. This model gives the farmer absolute control over what goes into the products created. With this philosophy in mind, owners Jim and Diana Murphy purchased twenty-five acres of land in Cross Plains, Wisconsin; just three miles from their previous home. First they worked to bring their newly purchased farm back to life; barns were squared up and reinforced, then given new roofs and siding; pastures were fenced and filled with animals, and fields were planted in alfalfa. The milking facility was licensed by the state in 2003. The following year Diana became a certified cheesemaker and the creamery (known as the "cheeserie" on Dreamfarm) was licensed as well. Finally cheese could be made! Alicia Murphy joined the farmstead business a few years later and received her cheesemaker license in 2018. Solar panels were added to the barn in 2014. Three years later, an overhang was added to the south side of the barn so the goat herd could have protection from the elements as well as a dry place to eat hay. Each year we strive to make improvements. In addition to our goats, we raise one beautiful Jersey cow, called Juniper. She provides enough milk to enhance our cheese selection at the farmers market, including single-origin cow's milk cheeses in addition to a mixed-milk cheese. She grazes lush green pasture that provides a rich, creamy milk. Chickens have been a part of our farm from the very beginning. Dreamfarm provides organic eggs from pasture raised laying hens. 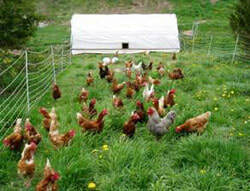 Our hens are raised in portable hoop-houses with access to a large fenced outdoor area that is moved every three weeks. To supplement the greens and bugs they get everyday, they are fed a non-soy organic grain. A dozen ducks also provide delicious eggs. The remainder of the menagerie at Dreamfarm consists of 3 to 6 grass-fed steers and 6 to 8 pigs which are sold for meat in the fall. The pigs are fed the whey from our cheesemaking. A small herd of primitive Jacob sheep also roam the pastures; a majestic, multi-horned breed that we raise for wool and to help preserve this heritage breed. No farm is complete without the loyal dogs and cats. Our dogs, Marly and Attica, are eager to guard the farm, greet our visitors, and offer love and companionship during long days working on the farm. Our cats are great compatriots and professionals in barn predator control. As Dreamfarm is a seasonal operation, springtime on the farm is exciting and busy. The mother goats (does) have their babies (kids) in March. This is when milk production begins, shortly after we begin seasonal production of our cheese. The sheep also lamb at this time. The chicks that we brood through the winter begin to lay eggs and they get moved to their summer pastures. Pastures emerge from beneath seas of white snow, trees bud, birds sing, and we farmers don our work boots and prepare ourselves for another season. Thank you for supporting family farms. We are certified organic by MOSA (Midwest Organic Services Association).